Given the choice, we’d all prefer to play when the sun is shining and the breeze is gentle. But sometimes, playing golf in the rain is unavoidable – especially if you play in club competitions. Unlike the top Pros, you don’t have the luxury of a caddy who’s sole purpose in the wet is to keep you dry. So what’s the alternative? One of the best set ups in the rain (and one also used by ‘caddy-less’ Pros) is an electric or push trolley with an umbrella holder fitted to the main arm. Carrying an umbrella and finding somewhere to lay it down during shots can be more hassle than it’s worth – especially if there’s even a hint of a breeze. You can see from the image to the right that an umbrella fixed directly above your bag will keep you dry during 90% of your round – and you won’t have to worry about chasing it halfway down the fairway! With this set up, you can hang a couple of towels and your glove in the spokes of the umbrella. If you have a lightweight stand bag (usually made with canvas), everything inside – including spare towels and gloves – is likely to get wet. Using the underside of your brolly as a clothes horse will keep things dry from start to finish. Umbrella attachments cost in the region of £10-£20 ($15-$30). If you’re put off by the cost of an electric trolley, decent push trolleys are very easy to manoeuvre and much more affordable. 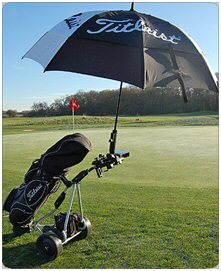 Golf umbrellas range from £15-35 ($20-$50). I recommend you buy a double canopy ‘windsheer’ umbrella as it helps to prevent the brolly from being turned inside out in strong winds. Most golf bags come with a hood attachment to keep the rain off your clubs. It’s worth keeping it in your bag at all times and using it if there’s even the slightest chance of wet weather. Without a hood, rain will soon run down the exposed clubs wetting the grips. You may also want to remove any head covers before you play. These can hold water like a sponge, soaking your hands and glove each time you have to remove them. Pack a larger towel too – a couple if you have them. A typical sized golf towel will be next to useless after a couple of holes. Probably the biggest challenge in the wet is keeping a secure grip on your clubs. 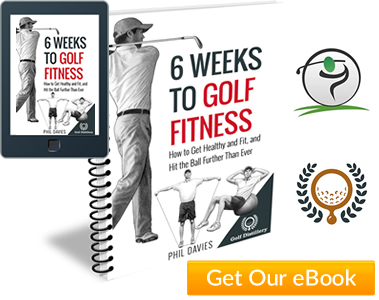 While the club is unlikely to slip right out of your grasp, it only takes a small amount of twisting, especially in the downswing, to cause a poor strike on the ball. That then knocks your confidence for subsequent shots. Firstly, take your glove off between every shot. Hang it on the spokes on the underside of your umbrella (see point 1 above) rather than placing it in your pocket. This will keep it dry for at least a few holes even in heavy rain. And don’t ever throw away old gloves – keep several of them spare in a polythene bag in the bottom of your golf bag. 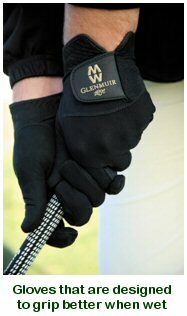 There are also golf gloves available that are specially designed to grip better when wet. If you struggle with your grip in the rain or your club’s grips are past their best, it’s worth considering a set of these. Secondly, avoid gripping the club more tightly because it’s wet. This might sound counter intuitive but if you grip tightly, any film of water between your glove and the grip can act almost like an aqua-plane making it more likely to slip and slide in your hands. Thirdly, when you come to buy a new set of clubs (or new grips for existing clubs) consider a cord-based grip. These grips have cord weaved into the rubber material and offer greater purchase when wet. 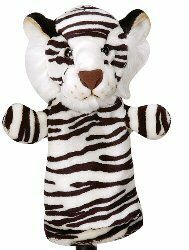 Golf Pride make a popular series of cord-based grips. Take one club more than you normally would for each shot. The ball won’t tend to travel as far in heavy rain, even when there’s no wind. Taking an extra club will also allow you to swing easy… and that will help you maintain good balance and a firm grip when it’s wet. When the rain is heavy, you’re going to hit bad shots. You’ll underhit putts and probably shoot a higher score than you’d like. But so will your playing partners and the rest of field. So let them get frustrated and disheartened while you make the best of bad conditions. 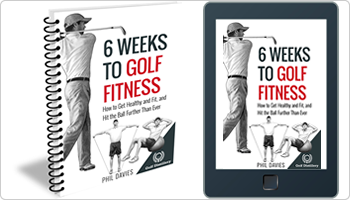 Wet weather will hinder your normal routine and your concentration on the course. But accept it. Smile at the inevitable bad shots and give the next your best attempt. If you can stay positive and persist, what you might ordinarily consider a disappointing score will probably turn out better than most.